As companies decide to adopt a more agile way of working, they also start to form multidisciplinary scrum teams. However, there still is a big challenge. When you work with several disciplines in your scrum team, you are exposed to the risk that you still create mini-handovers. First the business analyst will make the design, the developer(s) will build it, the testers will test it and if you’re lucky the business is happy in the end. Team members tend to keep doing what they’ve always been doing. Nothing really changed! Of course, we cannot realistically expect that the business suddenly starts programming, but it would be great if they know the difficulties that developers cope with. It works the same the other way around. We need to learn from each other and bring our work closer together. Last year we already found out that a robot is a great tool to get familiar with ATDD. Since then we’ve traded our Lego Mindstorm robot for a whole family of Makeblock mBots. 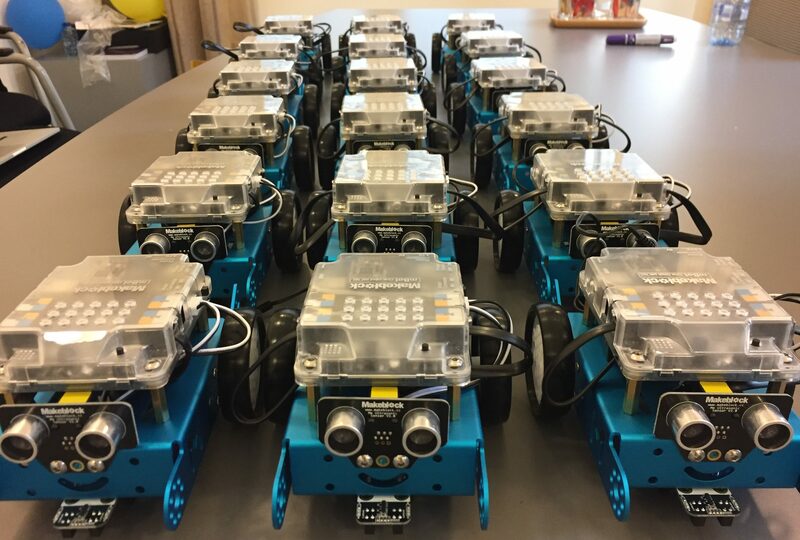 Out of the box these mBots can be programmed with a Visual Programming Language called Scratch. Makeblock created its own IDE for this ‘language’ called mBlock. This seems simple, but it turns out that writing complex features still requires good specifications and the same logic that is used in ‘more advanced’ programming languages. It’s easy to get started with, but difficult to master. Perfect for a workshop! At ING, a group of scrum teams that work in the same domain is called a tribe. Within ING these tribes come together for team building days. During this day they get a company update, but also have participate in some fun and learning activities. The goal is to learn from each other in another environment than the office and so become more connected teams. Xebia helped to organize this episode for the tribe ‘Advies & Affluent’. 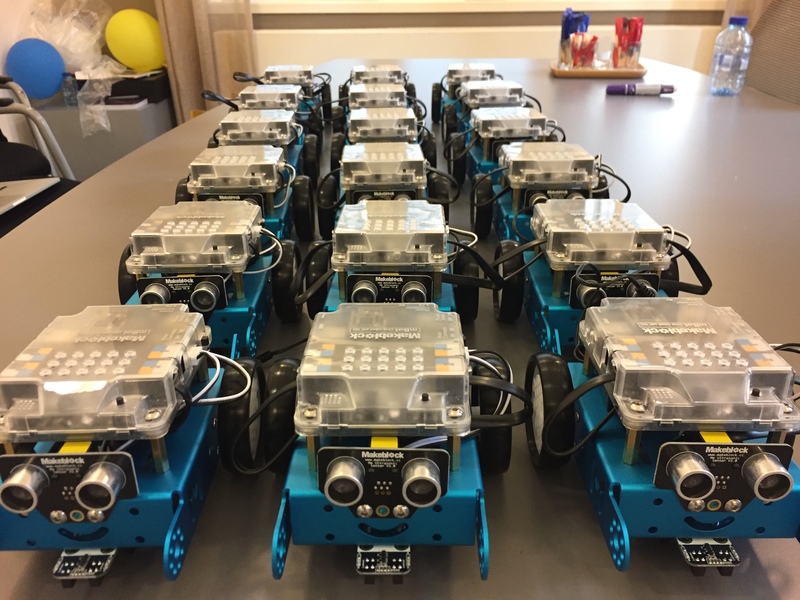 We drove 20 mBots out to the Undercurrent in Amsterdam-Noord. There, the biggest workshop we’ve done with the robots took place. We kicked-off the day with a short introduction on what an mBot is and how you program it. Teams could follow along live with a demo on how to get their robot to move forward. Next, the first assignment was to implement a ‘simple’ user story. The developers quickly realised that direction should be a variable, and they needed a speed variable since the speed might need to be different in the corners. They showed the business what they meant and the understanding grew. The business also grasped the concept of loops and statements and could see that changing requirements means that sometimes the code needs to change completely. They reached a shared understanding. We had a total of 15 teams, 80 people, competing in three sprints. Teams were rated on Specifications, Collaboration and Functionality. All those teams could practise their functionality on test tracks. At the end of the three sprints, the five teams with the highest rating were left to compete against each other on the main track. The team who was able to complete the track the fastest, while keeping to the requirements, won! This element really pushed the teams and put them in a competitive mode! Having 15 teams compete against each other, while learning things that can be applied in their daily work felt really great. People had a great time and we were asked multiple times how much the mBots cost and where to buy them. Some teams even continued fixing issues during the drinks at the end of the day. By the way: In January we will re-run our Robot workshop from TestWorksConf at TestBash Netherlands 2017. This is a short version of our ATDD robot training. Hope to see you there! OMG They made me Product Owner! !